I love to theme singing time around General Conference the week before spring General Conference (in the fall, we are too busy prepping for our program). General Conference singo is ALWAYS a hit! See details for using it HERE. It also is a great take-home for the kids before General Conference. The Living Prophets Song lesson plan HERE. Latter-Day Prophets is another one I add to the list this time of year. Find my lesson plan HERE. The actions for this song are a great way to help remember past prophets! I usually spend the first 5 - 10 minutes or so singing through this song, then spend the rest of the time on The Living Prophets Song (with or without the singo card). 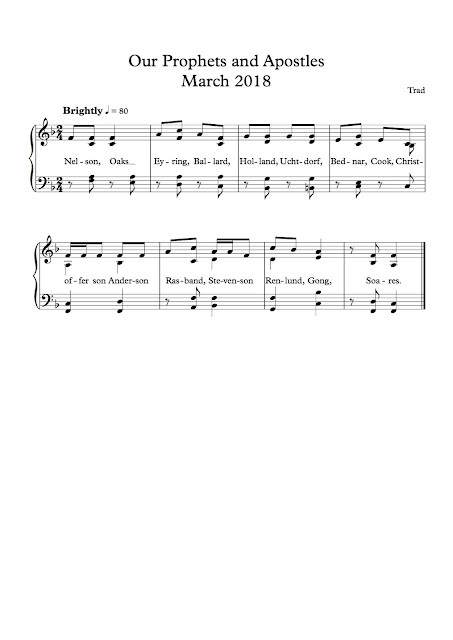 Would you be willing to email me the sheet music I can't get it all to print off the sides are cut off/ I would like it for the pianist. and me too haha you could also message me on facebook too I love this idea. I apologize if the post isn't clear but I don't have sheet music to email. I wish I did! What you see above is all I have. If someone sends me something, I'll update the post. Sorry I'm not more help. Here is the link on googledrive. Thank you SO much Diana! I've updated my post to include the link so hopefully everyone can find it! I really appreciate you sharing! Thanks for this idea, Camille! I did this lesson plan exactly today, and we had a great time. The Latter-day Prophets song took a little longer, since I had to teach them the actions, but it was really fun and I could see the kids were learning it. Now it's prepped and ready to go as a wiggle song! :D And the Sing-O with living prophets went great as well. Best of all, I've learned the names of all these important men myself! 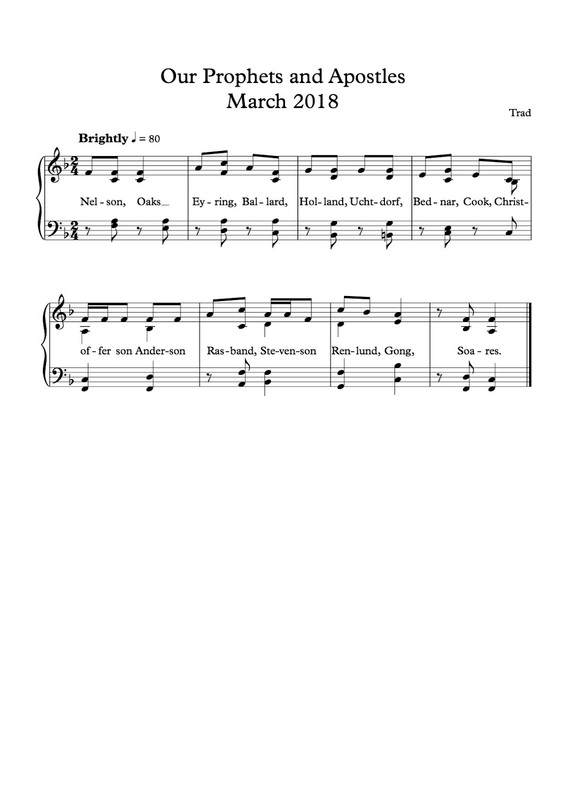 How do you play General Conference SINGO? Do you print one board for the whole primary? I have details on how to play on the link above, right above the singo image. But in a nutshell, I print out a 4x6 card for all the kids (I suppose you could print one for the entire primary just to use - but it may be blurry when blown up). Then I'll call out random names, including a quick bio of each one. We'll sing the The Living Prophets Song and the kids can all mark off the person using candy or a piece of paper. Everyone's gameboard matches but no one seems to mind. It's just a fun way to get more familiar with the Apostles/Presidency names and faces. I don't know how I missed that! Sorry! Thank you for responding so quickly and for sharing all of your ideas!! Is the point of the Singo to fill the whole card vs. a getting a traditional BINGO? And did you just give a little treat at the end for everyone? The goal is just to cover the entire page with some sort of marker while you learn a little more about each apostle and sing the song in between each one (so technically not really singo/bingo at all). Since everyone has the same gameboard, everyone will complete their board at the same time. I like to use candy as the markers then everyone just eats their candy when it's over. I've got my cards all printed and am excited for tomorrow! Do you have the kids rest their card on their legs or turn around on their chair? I'm worried all the candy is going to keep falling, especially for the smaller ones. They turn around and play on their chairs. With the little kids, I hav one for their teacher so we hey father around them, then just st give them a bag of candy at the end if you want. Hope that helps! Hi Camille! Is there any chance this will be updated in time for next Sunday? I want to use it next week and then do Easter the following week. I sure appreciate you and your blog; I don't know what I'd do without it! 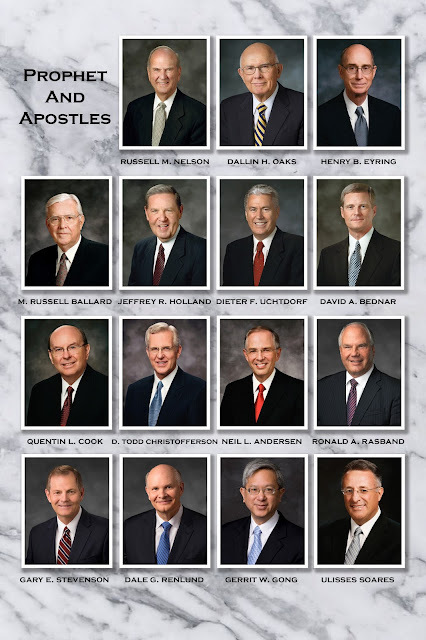 I would update it sooner but we are missing 2 apostles and I'm guessing we'll find out who they are over General Conference weekend. Do you have a solution for the missing apostles in the meantime? I'd love to hear! Oh true! I hadn't even considered that. Maybe I will just come up with a different conference idea. Maybe a matching game with songs that go along with quotes/pictures from what the first presidency and apostles said last conference. Does anyone have pictures of the two new members of the twelve?